“Homage to the Square” is a groundbreaking exhibit of twenty-five early Navajo rugs and blankets c.1870-1950, juxtaposed against a series of original modern artworks utilizing simple polygon design and complex color interaction. The Navajo textiles are selected for inclusion focus on minimalist composition and artistic color play, most being considered non-traditional Navajo designs. The nameless unrecognized Navajo women artists who created these weavings represent a unique form of America’s First People’s Modern Art aesthetics long before the New York contemporary art scene of the 1940s, 1950s and 1960s. Numerous vintage Josef Albers prints from his Homage to the Square series that examine chromatic interaction will be exhibited in close proximity to Navajo textiles with similar sensibilities allowing the viewer to draw their own conclusions as to the origins of America’s Modern Art movement. The show débuts at the Santa Fe Objects of Art show the night of August 10th and runs through August 18th at the El Museo Cultural de Santa Fe, New Mexico before traveling to Mark Sublette Medicine Man Gallery in Tucson, Arizona September 8th to October 18th. 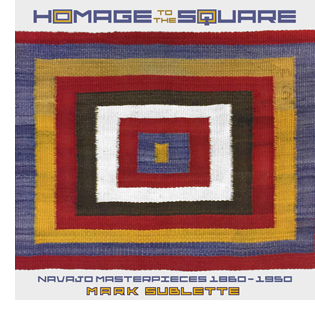 Homage to the Square, by Mark Sublette, is a groundbreaking examination of the Modern Aesthetic expressed in traditional Navajo weavings from 1860-1950 and their relationship to modern art produced in the 1950-70s. It is the first catalog to examine a unique form of America's First People's Art created long before the New York Contemporary art scene. Homage to the Square is a limited edition 112 page catalog with 109 color illustrations. Price $35. Date & Time: August 16th, 2:30 pm Entrance included with show admission.